Today I have a little break in my capsule sewing to bring a review of my Christmas dress! 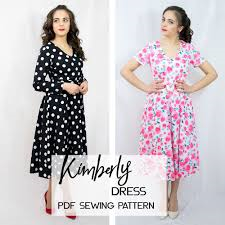 I had the privilege of being gifted the Kimberly Dress by Athina Kakou Patterns in exchange for an honest review. Let me first say what a wonderful base pattern this turned out to be! It has great lines and bones and is perfect for customization. It has a standard darted bodice with a v-neckline. It also comes with two sleeve variations. There are options for both a long and short sleeve. For my version, I decided to make it sleeveless so I could easily layer a cardigan over it or a turtleneck under it! Because of this and because I made my dress in a wool crepe, I lined the bodice of my version. This allowed me to finish my neckline and my armholes as well as cover the itchiness of the wool against my skin. I also just so happened to have just enough hot pink silk charmeuse to line this bodice so it feels heavenly against the skin. In addition to a basic darted bodice, this dress also features a half circle skirt that is finished off with a hem band. The weight of the hem band is magnificent on this full skirt because it gives it just enough heft to create a truly twirly silhouette! Another great feature about this pattern is that all the pieces are interchangeable with her Lisa Dress pattern as well (which I own!) so it makes for some truly endless options in dressmaking! Overall, this is a fantastic pattern for a dress of any occasion and will definitely be made up again! It’s definitely beginner friendly and if you’re new to any of the required skills, she has fantastic sew alongs for all her patterns on her YouTube channel. If you’re interested in any of the changes I made to the pattern (for my body) you can check out a few of the vlogmas episodes on my channel when I was making it up. I also have a video where I go into more detail below! That wraps it up for today!